Ready, set, go! Tammy Kaehler is here today to tell us about her latest Kate Reilly racing mystery and matching it with the perfect drink to stay hydrated. If you like fast paced, mysteries with strong heroine's you'll love Kate Reilly. Check out the link to the excerpt of Red Flags below. Racecar drivers spend a lot of time thinking about being hydrated. In a typical one- or two-hour stint in the racecar, a driver can lose anywhere from five to ten pounds of sweat. Five to ten pounds! Taking in enough liquid before they get in the car and replacing it afterward is critical. Kate’s a dedicated athlete, a healthy eater, and committed drinker of at least eight glasses of water a day, if not more. As her creator, I’ll only lay claim to the latter—I might not do much else, but I drink plenty of water every day. But, honestly, there’s nothing fun about the plain, nothing taste of water day in and day out. So Kate and I add stuff to it (I even add bubbles, with a DIY contraption). You can find plenty of recipes and suggestions for what to infuse your water with—the most popular are any kind of fruit, cucumber, and even herbs like lavender or basil. I like to stick to the basics: lemon and mint, with strawberries when I can get them. The big secret is in the steeping time. Make sure to chill the water with the fruit or other ingredients in it for at least an hour, and preferably more. That will really let the flavors blend. Professional racecar driver Kate Reilly arrives in Long Beach, California, to promote the upcoming Grand Prix, not expecting to identify a dead body or solve another murder—especially when the victim’s a relative she didn’t even like. Her new sponsor and the race organizers apply pressure, wanting to keep racing’s image clean, and Kate reluctantly agrees to investigate. From Sony Studios to Venice Beach, from Rodeo Drive to the Hollywood Hills, Kate plunges into the Southern California scene. She parties with movie stars, “takes meetings,” and shops with rich housewives, all while trying to uncover a motive for murder. At the same time, she’s negotiating the next steps in her professional racing career, including testing a new racecar on an oval track. In the flurry of excitement, neither Kate’s murder inquiries nor her personal life run smoothly. She discovers more about the disreputable members of her father’s family than she expected or wanted to know, and her temper frays. She publicly juggles two attractive men, drawing intense and unwanted attention from paparazzi. And worse, this ballooning media exposure generates national commentary about her career choices, talent, and femininity. The Long Beach race weekend begins with Kate constantly on the go, fielding questions, involved in three separate racing series, and closing in on a killer. Red flags warn her of danger in the racecar, but off-track, Kate finds it hard to heed the signs and stay out of a killer’s grasp. Tammy Kaehler is a lifelong reader who never thought she'd be writing mysteries or be a fan of racing. But now she's hooked on telling stories about a strong, smart, savvy woman whose day job involves walking the line between chaos and control, speed and death. 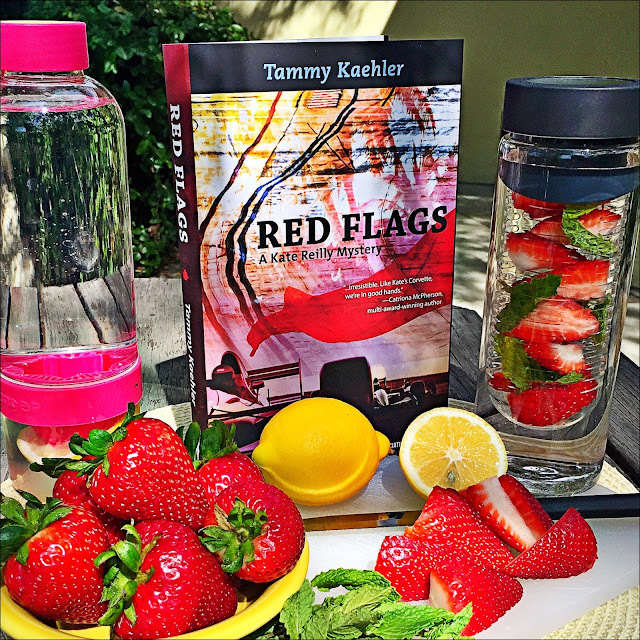 Mystery fans and racing insiders alike have praised her award-winning Kate Reilly Racing Mystery Series (Dead Man’s Switch, Braking Points, and Avoidable Contact), and Tammy takes readers back behind the wheel in her fourth entry, Red Flags. She works as a freelance writer in the Los Angeles area, where she lives with her husband and many cars. The book sounds fabulous. Adding it to my TBR pile. Love the drink too. And thanks, Deb, for allowing me to join you on Mystery Playground! Thank you for a great book and drink. Can't wait to dig into Red Flags!